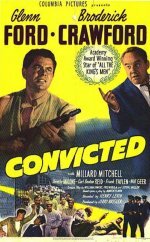 Jailed for manslaughter after killing a man in a bar-room brawl, Glenn Ford becomes romantically entangled with Dorothy Malone, the daughter of governor Broderick Crawford. Ford's situation worsens, however, when he sees convict Millard Mitchell kill another inmate. Although strongly cast, well played and competently directed by Henry Levin, this prison melodrama - the umpteenth to be drawn from The Criminal Code (1930) - is so monumentally routine that it quickly becomes predictable. Prison drama starring Glenn Ford. Joe Hufford is wrongly sent to jail after the son of a wealthy politician is accidentally killed in a nightclub brawl. Inside, Joe sets about proving his innocence.